The Illinois ASBO UPDATE Magazine is your indispensable tool for learning about the field of school business management! Each issue highlights a specific subject area within the industry, providing thought leadership to help you succeed in your chosen profession. To ensure the UPDATE remains relevant to your needs, content ideas are brainstormed through an Editorial Advisory Board – consisting of a liaison from each of the professional development committees. To learn more about opportunities to participate and contribute, get involved on a PDC. Log into your account to access the UPDATE! Not a member? Become a member now to access the UPDATE as well as other essential member resources! The Illinois ASBO UPDATE Magazine is a professional publication and a primary resource for information and professional development, providing leadership and networking on emerging school business issues. 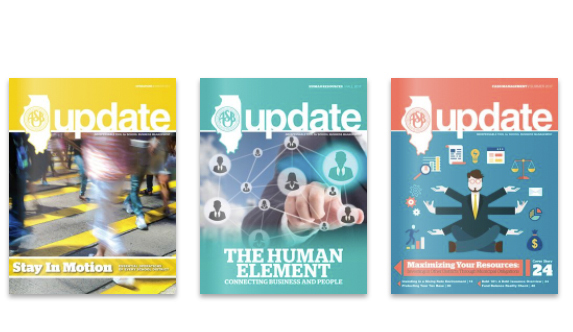 The UPDATE Magazine is available as a member benefit. Not a member? Join today and take advantage of all that Illinois ASBO has to offer! SEE ALl THE BENEFITS OF MEMBERSHIP! A more scholarly look at the profession, with opportunities to submit your work or advertise your services. Your monthly guide to tasks that need to be completed in the school business office. Specialized guides to purchasing, risk management and payroll - created by Illinois ABSO memebers!